The Blog has posted multiple articles about our state’s gun laws in the past few weeks as Maryland’s controversial gun laws just cannot seem to stay out of the news. This week was no different, with another headline courtesy of the United States Supreme Court. The Court recently announced that it would not hear argument on the statewide firearm carry permit law, which was upheld by U.S. Court of Appeals for the 4th District this past year. The challenge to the law began when a gun owner from Baltimore had his concealed carry application denied because he could not prove to the state that he had a “good and substantial reason” for the license. This was despite the fact that the man’s house had been burglarized multiple times. The gun owner filed suit in federal district court, and was joined by The Second Amendment foundation, an organization that opposes firearm restrictions. The district court judge agreed that the law was too restrictive and vague, and found it unconstitutional. But the victory was short lived for plaintiffs after the Appellate court reversed and held that the law could stand. Both parties were confident that the Supreme Court would settle the issue for good (and in their respective favor), but it wasn’t to be as the Court decided the 4th Circuit would have the final say. The good and substantial requirement is here to stay, and after the victory, the Attorney General’s office can now focus on other pressing issues such consumer protection and cyber bullying. But chances are that there will be additional challenges to this law, and other state gun laws in the future. Legal challenges to the Firearm Safety Act of 2013 are already underway. This law requires all gun purchasers to submit fingerprint samples to the state police, and outright bans the sale of high capacity magazines and certain assault rifles. We just posted an article about the act when it became effective on October 1st, and now its constitutionality will be determined at a federal court trial in February. The trial is scheduled to last just 4 days and will likely determine whether our state’s legislature keeps trending toward stricter gun control, or if it decides that enough is enough. Both of these court cases continue to land Maryland in the national news but out on streets there are legitimate questions as to whether these laws make us any safer. Most violent gun crimes are committed by those who have no concern for the legal restrictions placed on carrying or owning a firearm, and a large percentage of guns on our streets are bought and sold illegally. As long as there is a demand for weapons, someone will be able to come in and satisfy it. Supporters of restrictive gun laws argue that even a small likelihood of curbing gun violence through legislation justifies their cause. 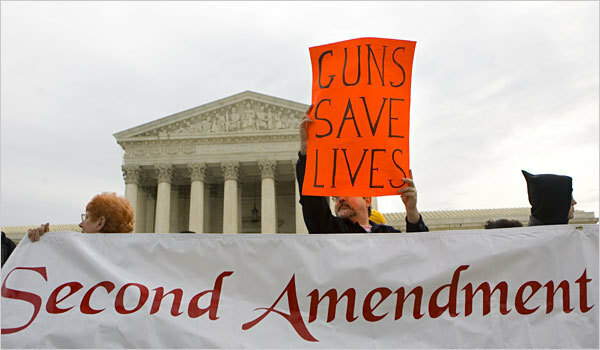 Supporters of the Second Amendment such as the National Rifle Association could not disagree more. As per the norm, the Blog will track this most recent legal challenge, and post an article in the future. Benjamin Herbst is a Maryland gun lawyer, who handles possession, sale, and transportation crimes. Contact Benjamin at The Herbst Firm for a free consultation about your case.